How awesome are burger patties?! I love them, they are so easy to make and they are furthermore healthy if they are not deep fried. I have been experimenting with all kind of veggies like zucchinis, carrots, celery, and cauliflower to make these fritters. 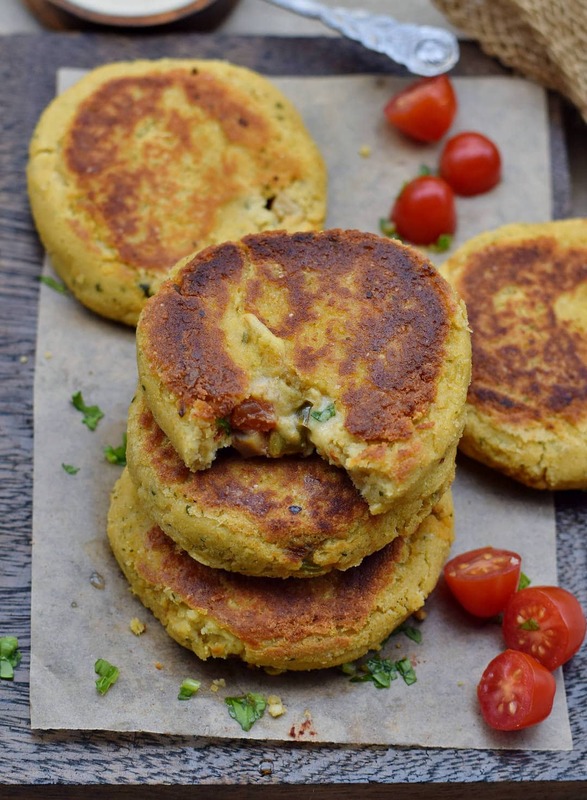 This cauliflower patties recipe is my absolute favorite. They are also high in fiber and protein. Yes, high in protein because of the chickpeas, chickpea flour, and the flax seeds. 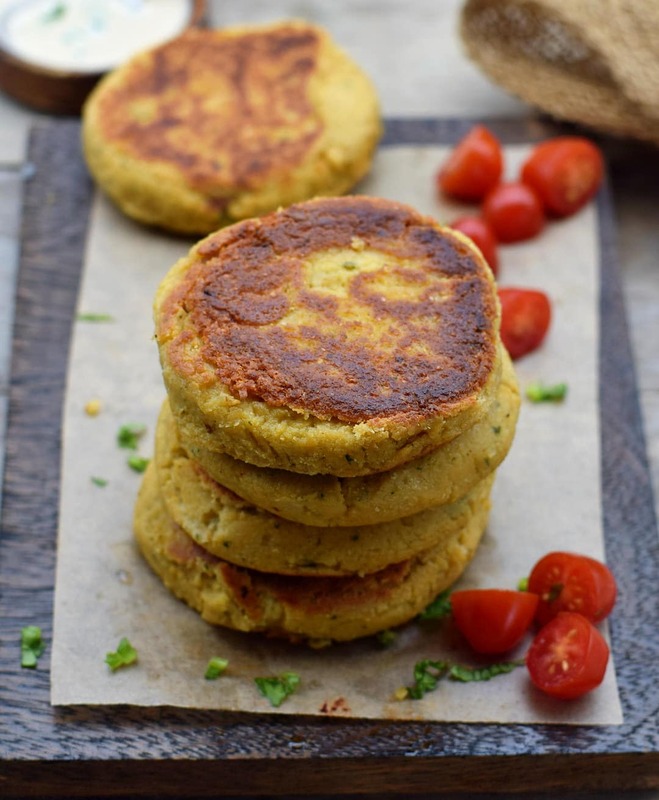 The flax seeds contain furthermore omega 3 fatty acids which makes the patties even healthier. 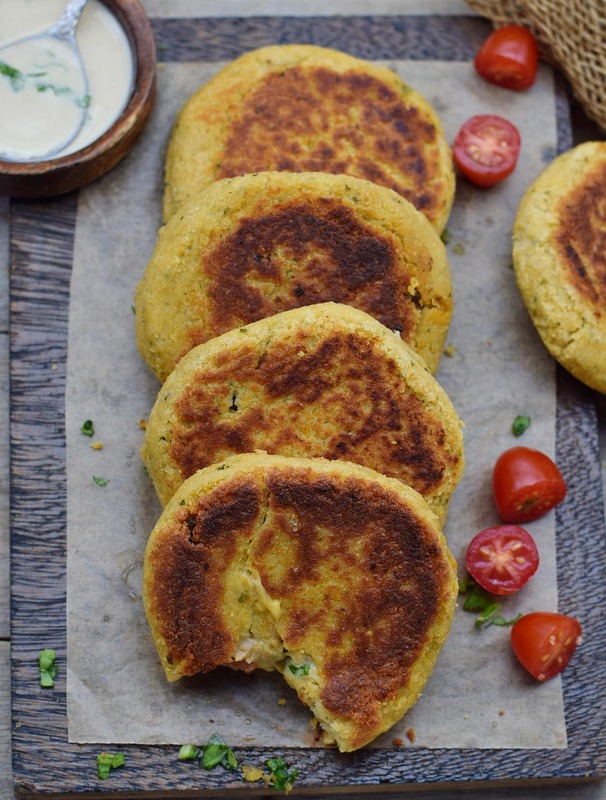 You can eat these cauliflower patties as a snack with mustard or a cashew cream cheese spread. Another possibility is to serve them as veggie burgers or add them to your buddha bowl. You can also add some grated vegan cheese or finely chopped veggies to the batter like peppers or zucchini. 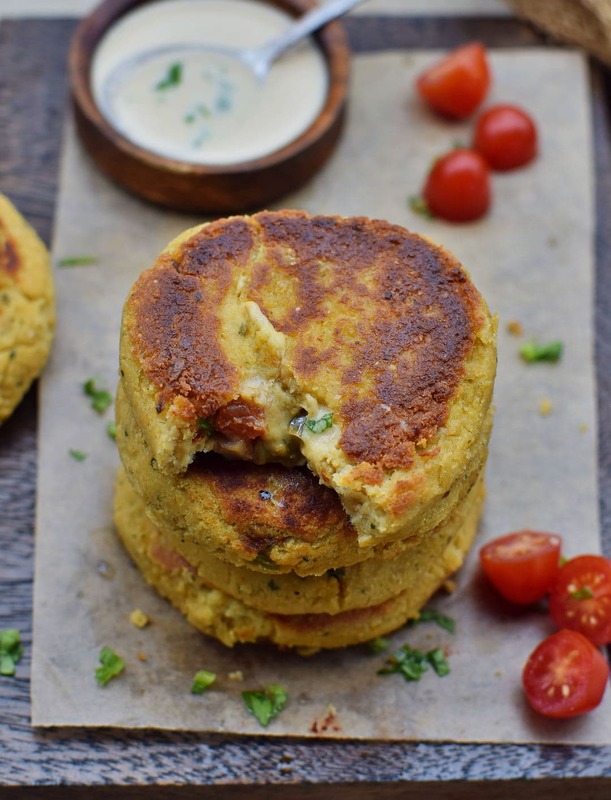 These cauliflower patties contain wholefood plant-based ingredients only. 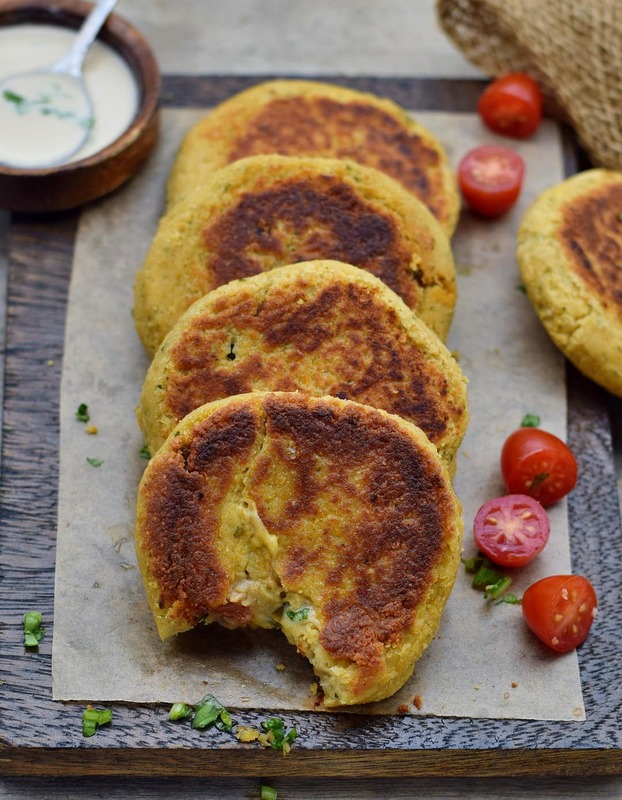 The recipe is so simple and these patties taste very delicious. They actually taste so good that I always have to resist devouring them right out of the pan. Doing this is not a great idea, as I tend to burn my mouth haha. This recipe is so easy to make and won’t take more than half an hour. Of course, you could also bake the cauliflower patties in the oven if you don’t want to use any oil to fry them but it will take much longer and they won’t be crispy. 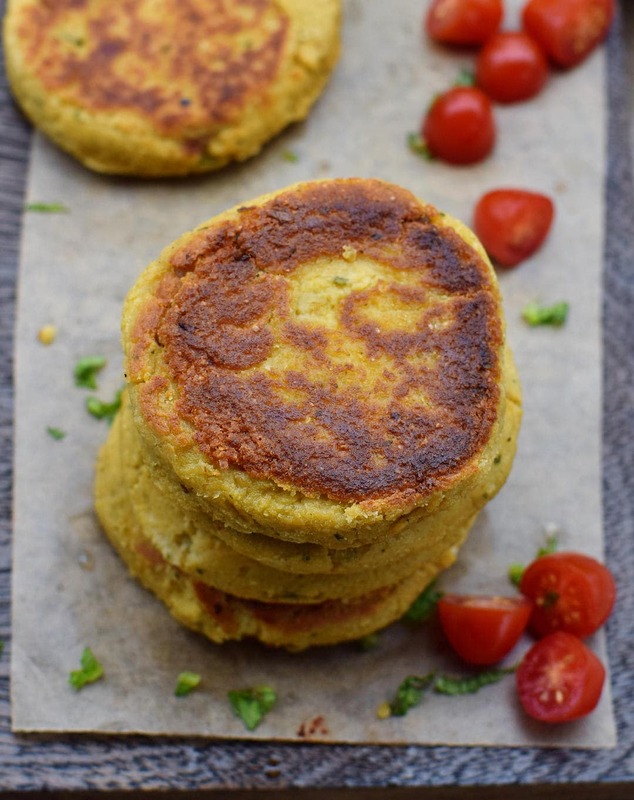 I hope you will enjoy my cauliflower patties recipe. If you try it out please leave a comment below and/or tag me in your Instagram or Facebook post with @elavegan and #elavegan so that I can see it and leave a comment. Cook the cauliflower florets in salted water until tender, then discard the water. Meanwhile combine all dry ingredients in a bowl, set aside. Pulse all wet ingredients (except the oil for frying) in your food processor until combined (don't over process). Add the wet ingredients to the bowl of dry ingredients and mix everything together with your hands. Form 8-10 patties and fry them with some oil in a skillet from both sides (about 5 minutes each) until golden brown. Serve with mustard or any other dip of choice. 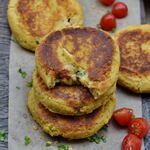 You can add a little bit of grated vegan cheese and some chopped veggies to the batter to make the patties taste even better. This step is optional. The recipe makes 10 patties. Nutrition facts are for one patty. This is AMAZING! The recipe itself is so easy to make, and all the ingredients are very easy to find in Russia. I’ve always struggled with vegan recipes, because some ingredients are super expensive or you simply have to order online from other countries. But back to this patties. They are so soft, the texture is perfect. I’v never tried better vegan patties ever. Thank you for this recipe. Wonderful recipe. Made it twice so far and my kids loved it. They normally hate to eat cauliflower, but when I “hide” it in these patties they really enjoy it. Thank you! Made these little ones. Very easy and quick receipe! Personal tip: don’t make them too big, and bake them long enough so they are nice and crunchy & you’ll love them! Really happy they turned out great. Thank you, Nina! How long did you bake at what temp? I would like to do the same as well to keep them oil free. I would suggest 180 degrees C. Bake for about 15 minutes per side (or until golden brown). I loved this recipe! It was liked by my husband too. It’s so full of flavour and nutrition. I added some nutritional yeast for a cheesier taste. I also didn’t have chickpea flour so I substituted it with regular apf and some panko bread crumbs for a crispier texture! Thank for this lovely recipe, Ela! These look great Ela! I am not a huge fan of cauliflower unless it’s masked well and these look perfect. I LOVE chickpeas and use them so much it should be illegal, haha! Love how easy they seem too! These are amazing. They were so easy to make. My family loved them as well. I’m so excited to try your other recipes. Everything is so beautiful.. Thank you. DIe waren echt super lecker, danke!!! Ich hab charlotten statt onion powder benutzt, hat gut geklappt! I’ve got to make these this weekend because they look and sound so good! I’m still a “work in progress” vegan and struggle with meal planning because my husband isn’t keen on it. Thank you, as always, for your delicious recipes. I look forward to reading and making them! Do you think these would turn out well baked? These sound delish but I don’t care for fried foods. Love these! Made a few changes as I didn’t have the exact ingredients. Used quinoa flour instead of chickpea flour. Used celery leaves instead of parsley. Used olive oil. Used dried onion flakes instead of powder. No salt added. Australian tins are mostly 400grams so probably should have added some extra wet ingredients, but still very nice, thank you! Recipe calls for oil for frying but directions say to bake. Are they fried or baked? Or both?! These patties are to die for and a perfect accompaniment to any buddha bowl concoction. I had these with quinoa, tomatoes, artichoke, kale and a lemon hummus dressing. I think my omni family will happily eat these too. Love love love! Thank you!! Hello! Do you think these would be good reheated the next day? Any tips on time and oven temp for baking option? You can try oat flour or buckwheat flour but it might not taste as good. I can’t eat flax seeds. Can I replace them with something else? I don’t have a food processor is there an alternative? I tried them a few days ago and really liked them, but I found it hard to find a sauce to go with it (I´m not a really big fan of mustard) do you have any suggestions? Just made your cauliflower patties. They are fabulous! So easy to make and held together very well. I used white beans as I had a can already open, but I will be making these again for sure and will use the chick peas next time. Thank you for this delicious recipe. It will be one of my regulars now. Love you recipes Ela! Thanks again. Is this recipe meant to be eaten with burger patties or can they be eaten by themselves? These are so good! I made a double batch because I had cauliflower I needed to use up. my 11 & 12 yr old omnivore children loved them. My youngest wasn’t as big a fan but she ate them. They smell as good as they taste and are filling. I fried the kids and baked mine and mine came out just as crispy as theirs. Very easy recipe. Thanks! Hi Ela can I make them and freeze them before cooking them, like a pull out the freezer quick snack?